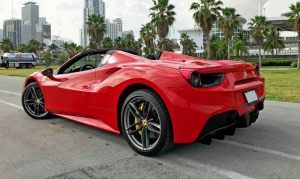 This exotic convertible Ferrari 488 Spider is just out of this world, this supercar is perfect! 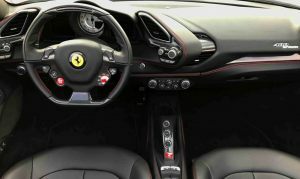 It incorporates the best innovation produced by Ferrari with a flawless blend of extravagant looks and superb performance delivered by a 3.9 liter V-8 rear mounted engine. 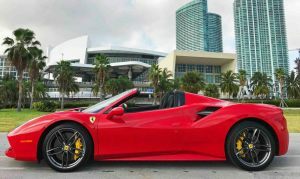 The countless hours spent by the most successful Ferrari engineers and designers alive made it possible to put together a fabulous architecture for a supercar exotic convertible to hit the streets. You will feel weightless while driving this luxury rental from Paramount Luxury Rentals because the car was built to provide the most pleasure for the driver. You have extremely well-tuned driving options that will allow you to almost effortlessly control the car at low and high speeds. Take more control of your destiny by adjusting control setting and allowing the Ferrari 488 Spider to adapt to you. Our favorite part of the car is that Ferrari built it around the Retractable Hard Top. This is the finest street legal luxury convertible on the road today. 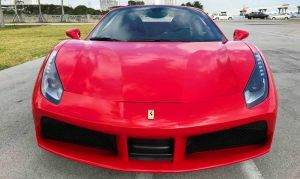 This exotic car rental is available at any of our locations in Miami, Fort Lauderdale, West Palm Beach. 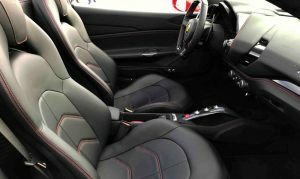 The outstanding synchronization achieved by Ferrari between the V8 powertrain responsiveness and the handling capacity makes this car one of our favorites. Have you ever reached 60 mph in less than 3.0 seconds? This is your chance! 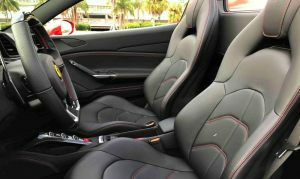 The inside of the car is just remarkable, you will make you fall in love repeatedly. Mainly because you are the closest to the engine and just one think glass window away from listening to the delightful sound of a rocket ship. Our rental process is simple and built with your peace of mind as the main objective. 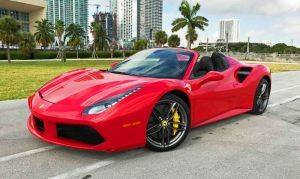 We will work to provide you all necessary details about the Ferrari 488 Spider to ensure an excellent worry-free experience on the road during the rental period. We offer airport pick-ups and the most rewarding members club in the industry. Also, we have in-house professional drivers as part of our Chauffeur Service in case you are looking to be driven around, enjoy a comfortable ride and get to your meetings/events in style and on time.